Preheat oven to 350°F. Place the almonds on a baking tray and bake for 6–7 minutes, until lightly toasted. In a sauté pan, heat the oil on medium heat. 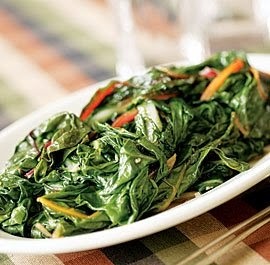 Add the Swiss chard and salt and continue to sauté until the chard is tender. Add the almonds and serve.